Kice rotary vane feeders are used to meter product out of storage tanks or into equipment such as Multi-Aspirators®. 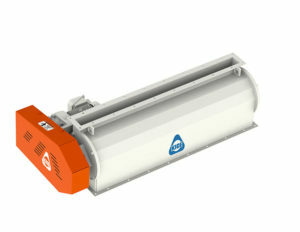 Sometimes called ‘blend vane feeders’, these units provide a constant, volumetric rate of feed. Many feeders on the market today are constructed out of aluminum which is not only a weak material, but can produce shavings that are not caught by magnets. Kice rotary vane feeders are built with heavy duty, mild steel that will provide years of reliable service. Shafts are oversized for durability. Ball bearings have flanges with seals to keep product from leaking around the shaft. Materials of construction are standard in heavy duty, mild steel. Stainless steel is available upon request. Kice rotary vane feeders are offered with two different rotor diameters and vary in length to fit each application.